Posted on 10/29/2015 by Mathew Harkins	in Live Review and tagged Black Cat, post-punk, We Were Promised Jetpacks. 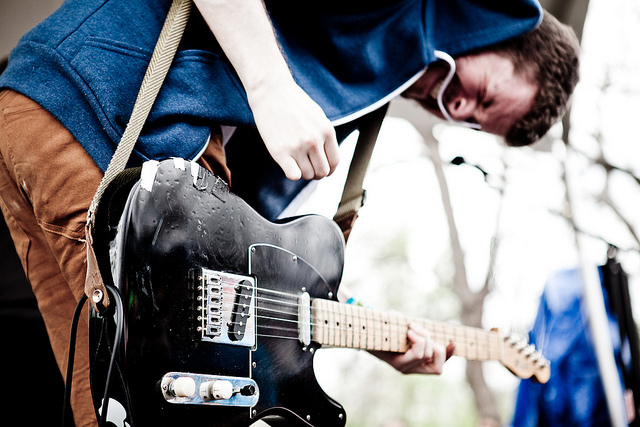 We Were Promised Jetpacks is coming to Black Cat on Friday, November 6 with Seoul. WWPJ is touring in support of their most recent album, 2014’s Unraveling, on FatCat Records. Unraveling finds the Scottish band displaying a well-earned maturity, having been playing together since 2008, touring extensively over the past seven years, and releasing three studio records. There is a measure of restraint on many of the songs on this album, sonically embodying a coiled muscle just waiting to snap into percussive momentum. You’ll hear that muscle flex as well on this album, complete with grooves and instrumentals on the back half of the album, but as a whole, this record paints the later years of unsure young men, still uncertain, but more contemplative and striving forward. It’s difficult to forget the center-stage drums that drove songs like “Quiet Little Voices” on their debut album, These Four Walls. They were one of the signature sounds of this band, a cornerstone of the post-punk side that sidled up against emo but never tipped the edge. They contained a energy that was Interpol without the leering darkness, Attack on Memory-era Cloud Nothings, with the angst more controlled (more being the operative word). That iteration of the band was a strong one, one that brought them well-deserved attention, and they have since evolved during the intervening years. I don’t believe that one iteration of the band is better than the other, but instead that we as listeners are gaining a better fleshed-out band, one with deeper characterizations. We get a band that doesn’t hinge on just a few tricks but instead is more fully realized, more unique, more human, and more honest. In the DC live music scene, the Black Cat holds a unique position. It’s perfect for yet-to-break-through bands bursting at the seams, and even more ideal for known names that thrive in tight, emotionally resonant spaces. We Were Promised Jetpacks is exactly that band thriving in this space. These are walls ideal for bouncing Adam Thompson’s vocals, for pounding Darren Lackie’s drums so resonantly you feel them in your bones. Take this opportunity to see this great, powerful band and you won’t be disappointed.